The Harry S. Truman Little White House is a not-for-profit foundation that once served as the winter White House for President Truman in 1946-1952 and a Cold War Response site for later leaders. The site is now home to the living Key West museum and a place of retreat for United States government leaders. The Harry S. Truman Little White House was originally constructed for naval officer housing in 1890 and is the only presidential site in Florida. The site served as the Naval command headquarters during several major conflicts including the Spanish-American War, World War I and II. Six United States Presidents have used the house included William Taft in 1912, Dwight Eisenhower, John F. Kennedy in 1961-62, Jimmy Carter in 1996 and 2007 and Bill Clinton in 2005. The most important usage, and its namesake comes from Harry S. Truman’s usage of the house from 1846-1952. Truman spend 175 days total living in the home during winter months of his presidency. Other important events that have taken place at the house include inventor Thomas Edison and scientist Edward Hayden using the home for long term stays as well as international peace talk summits and the completion of the $1 million restoration projection in 2009 that turned the home into the Key West Museum. The main attraction of the Harry S. Truman Little White House is the home itself. Guided Tours are offered every 20 minutes throughout the day where visitors can enjoy the historic details that take them back in time to see what it was like to live as The President of The United States in the 1940’s. Nearly all of the furnishing in the home are original to when Truman resided in the house in 1949 with more restoration being completed to the interior to make it even more accurate to the time period. Surrounding the museum is an acre of tropical botanical gardens enclosed by the original wrought iron fence. 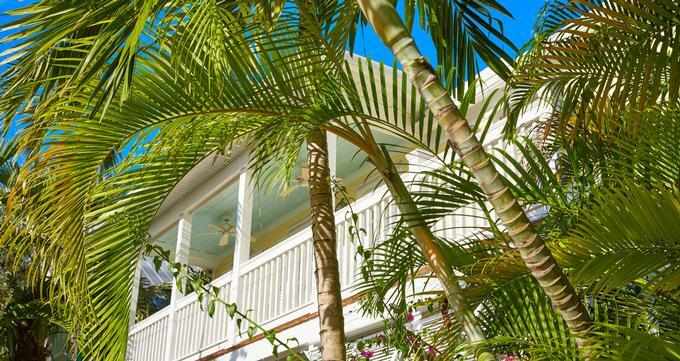 Visitors can tour the grounds of the property and see many house plants that they have on their porches and sun rooms that in the gardens have grown to unbelievable heights in the Key West climate. The garden tours are open during daylight hours and are self-guided. The gardens are undergoing massive restoration to return them to their 1949 appearance so many sections may be closed off at times. The museum is considered a living museum, meaning that it is not restricted to one historic event and instead embodies an entire time period, focusing on the Presidency of Truman and the 1940’s and early 50’s of Key West history. All public rooms are handicap accessible and printed scripts are available in multiple languages. The Little White House is open 365 Days a year even holidays, however, the home is still used for government functions and can close with very little notice to accommodate government and international visitors. The Little White House is home to the yearly Truman Symposium. This special event requires advance registration and includes and welcome reception on a Friday night and a full day of conferences and speakers on Saturday. The 2017 program will cover Latin and South American Policies. Past Symposium Conferences have covered topics such as Healthcare Policies in The United States, The Legacy of the Korean War, Truman’s Nuclear Legacy, National Security, and Civil Liberties. All symposium’s tie back to policies enacted under Truman’s presidency. There are also field trip opportunities that provide a workshop in democracy appropriate for grades 4 and up offered at The Little White House. The tours are fully narrated by museum docents and reservations are required. Students can learn about the use of the atomic bomb, segregation, the armed forces, recognition of the state of Israel, The Truman Doctrine, NATO, Everglades National Park, and The Korean War among various other topics. There are several special events that take place at The Little White House throughout the year including an annual Easter Egg Hunt in April, special art exhibitions, and community cook offs. The estate can also be rented for private events such as weddings, conferences, holiday events, or parties. The Museum Store features White House collectors ornaments that can only be found and purchased at the Museum store in person or online. These special ornaments have been custom designed to honor the heritage of the Little White House and the state heritage of Key West Florida. There are also many relics and artifacts that have been reproduced and replicated to commemorate Truman’s presidency and the era of the 1940’s and 50’s.